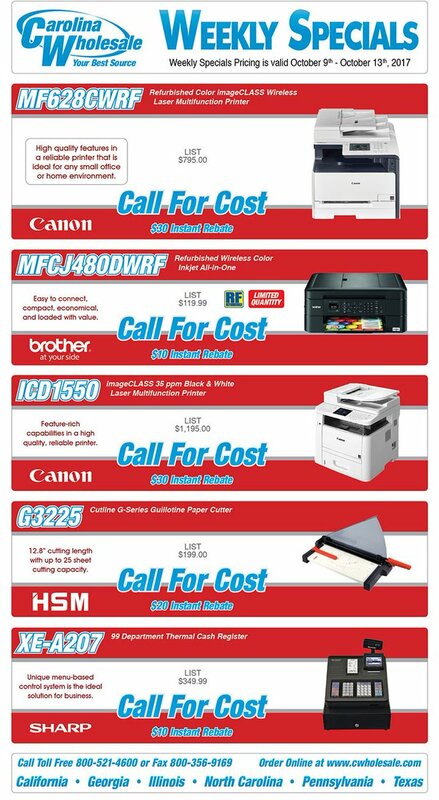 Discover new deals this week on Canon new & refurb SFP/MFP, Brother, HSM, and Sharp Electronics | Industry Analysts, Inc. Check out special pricing offered on the above products from Carolina Wholesale! Carolina Wholesale Office Machine Company, Inc., one of the largest office machine and supply distributors in the country, is celebrating its 45th year in business. Our breadth and depth of product mix is unsurpassed in the industry – fax machines, printers, copiers, calculators, typewriters, dictation/transcribing, telephones, presentation equipment, paper handling, shredders, cash registers, time clocks, and supplies for each. For over four decades, we have built our reputation and success by providing consistently excellent service and favorable pricing. This entry was posted in Uncategorized and tagged Brother, canon, Carolina Wholesale, Digitek, Sharp by IA Staff. Bookmark the permalink. ← Previous Previous post: Is iOT the answer for everything?